Acer on Wednesday announced a bunch of new gaming PCs at its [email protected] press conference in New York. At the event, the company unveiled the new premium Chromebook Spin 13, the world’s first 15.6-inch 2-in-1 Chromebook, as well as the beastly Predator Helios 500, among other desktop PCs and accessories that cater to a wide audience. 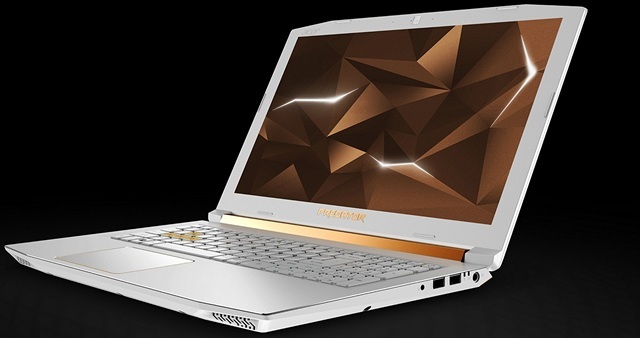 It also revamped the popular Helios 300 notebook and gave it a new limited edition colour. The Helios 300 Special Edition is a fully-revamped version of the standard Helios 300, not just on the inside, but also on the outside. First off, it gets a cosmetic makeover by way of an all-white design with a gold trim. While it does look a bit garish, it does help it stand out from the crowd of black gaming laptops. The device also comes with all-new hardware, including a 144Hz display, but it is still a 15.6-inch IPS panel with a FullHD (1920 x 1080) resolution. The faster refresh rate, however, should help the monitor offer smoother gameplay with shorter frame-rendering and input delay. The laptop also gets an 8th-gen Core i7+ CPU, which is an upgrade over the previous model. The GPU, however, is the same GTX 1060 card. The new Helios 300 Special Edition also comes with up to 32GB of DDR4 RAM, and includes Bluetooth and Wi-Fi connectivity. The white and gold special edition will only be available till September 2018, and will go on sale soon, starting at $1870 in the US.